Paradefloat.net... Parade Float Decorations and Parade Float Ideas! The unique way to promote your business or organization all year long! Christmas parades, 4th of July, Memorial Day, Mardi Gras, and St. Patrick's Day parades are what most people associate with when mentioning a parade, but there are many different festivals & celebrations that take place for every season with thousands of people attending these events each year. A parade float promotes your business or organization while showing community support. Let us help you create a new and exciting way for you to advertise with a new parade float! We have over 45 years of award winning experience building parade floats, along with rental floats. Need help with a parade float idea? Our design team will work with you on the ideal parade float for your business or organization. 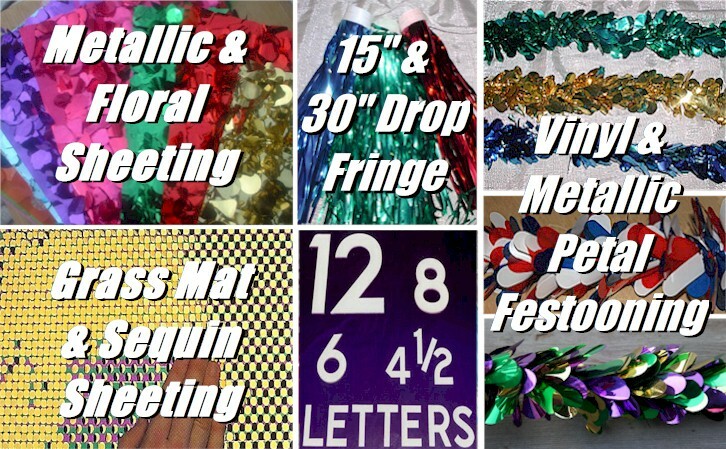 We also have all the parade float supplies you will need to decorate your parade float. Copyright © paradefloat.net. All rights reserved.